Remember that scene in Studio Ghibli's "Kiki's Delivery Service" (1989) when little witch Kiki is surprised with a personalized cake from a nice elderly woman? Kiki previously helped the woman make a scrumptious looking herring-and-pumpkin-pot-pie (it's on "the List"! ), and then delivered said pie atop her broom to the lady's granddaughter. Even though making deliveries is Kiki's job, she went above and beyond to help the woman (her oven was broken and Kiki was in a time crunch, etc.) because Kiki is an honest and determined sort of person. This is what the lady wants to repay with her gift and calls Kiki to her home for a special "delivery". 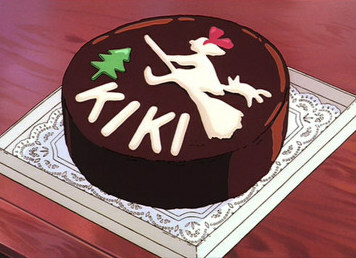 Kiki: [Gasps after opening the box to discover a chocolate cake inside with her name and depiction on it.] "I don't get it." Lady: "Would you please bring this to a young delivery girl? She was kind to me and a very big help. It's my way of saying thank you. Ah, yes, and can you find out when her next birthday is? Then I can bake her another one." Kiki: [Turns to the woman, wipes away her tears, and smiles.] "Of course I will! And maybe the young girl will want to know the lady's birthday because she'll be able to give her a present to repay her!" At this point in the movie (spoilers!) Kiki has lost her ability to fly and is struggling with thoughts of her future as a witch. The unexpected gift serves as fodder to melt away Kiki's insecurities and worries about the future and the life and vocation she has chosen. The special homemade cake is evidence that Kiki is appreciated and loved. 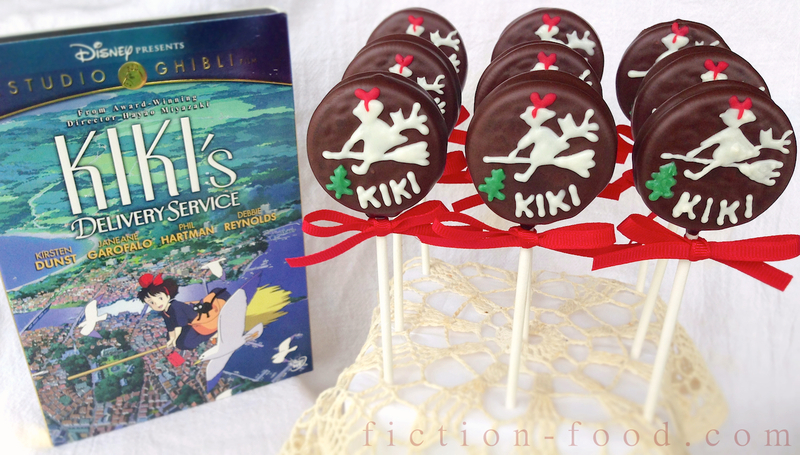 Note: Ghibli's "Kiki's Delivery Service" is based on a novel series by Japanese author Eiko Kadono. Only the first book made it into English and sadly it's now out of print. 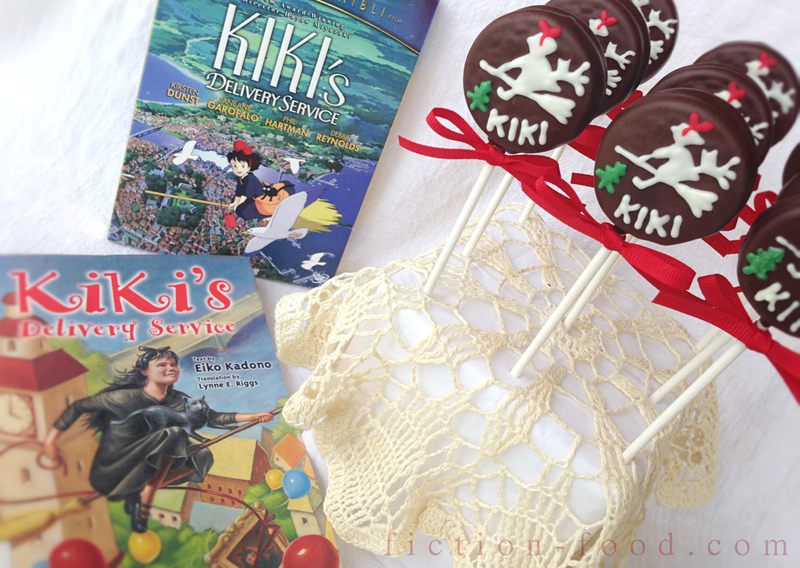 A chocolate cake doesn't appear in that book, but it might later on in the Kiki series. I included the book in the photo directly below though just to show that there is a book. If you'd like to learn more about the book (and the food in it) please read my review post here. And just FYI, a live-action adaptation of the novels was released in Japanese theaters this spring. I sure hope it makes its way to the US (subtitled blu-ray, please)! Red Ribbon, 12 pieces cut 9" long. 1. Carefully open the sandwich cookies & lay the halves out on a large cutting board or tray. Pour the chocolate chips into a microwave proof bowl or cup & zap for 30 seconds. Stir & then heat for another 30 seconds. Repeat this process until the chips are evenly melted. Add in a small amount of oil so the chocolate gets really nice & smooth. One at a time, dip the lollipop sticks about 1" into the melted chocolate & then gently press the dipped sticks into the center of the cream-side cookie halves. Reassemble the cookies (careful not to break them when you press them together! ), now with lollipop sticks in the middle, & lay them on the board or tray, & then place them in the freezer for a couple of minutes to set. 2. Dip each cookie into the melted chocolate until fully coated (pour the chocolate into a tall cup if your container is too shallow), letting the excess drip off into the container before sticking it upright in the styrofoam block or pop holder (tapping the wrist of the hand holding the stick helps the excess chocolate to fall off). Let the chocolate solidify before moving on to the next step. 3. Melt the white chocolate the same way you melted the dark, adding a small amount of oil to make it smoother & flow more easily. Pour the melted chocolate into a candy decorating bag or plastic baggie with a #1 frosting tip attached or simply cut a teeny-tiny hole in one corner of the bag once the chocolate is inside. 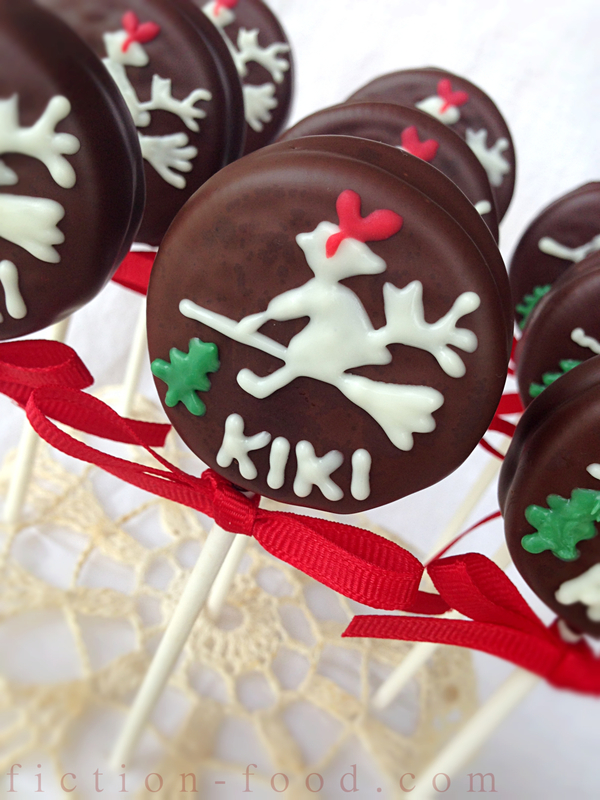 Lay the pops flat on a large piece of waxed paper & carefully pipe the white decorations onto each cookie; the name "KIKI" & Kiki's silhouette on her broom with Jiji the cat holding on behind. Quickly use a toothpick for any fine-tuning. Let sit for a few minutes to harden. 5. Melt the green candy melts same as the others (add oil) & spoon the melted mixture into another bag with tiny tip or snip. Carefully pipe a little green pine tree onto each cookie, quickly using a clean toothpick to make the three triangle shapes of the tree if needed. Lastly, near the bottom of each stick, tie a bow using the red ribbon & then slide the bow up to just under the cookie. 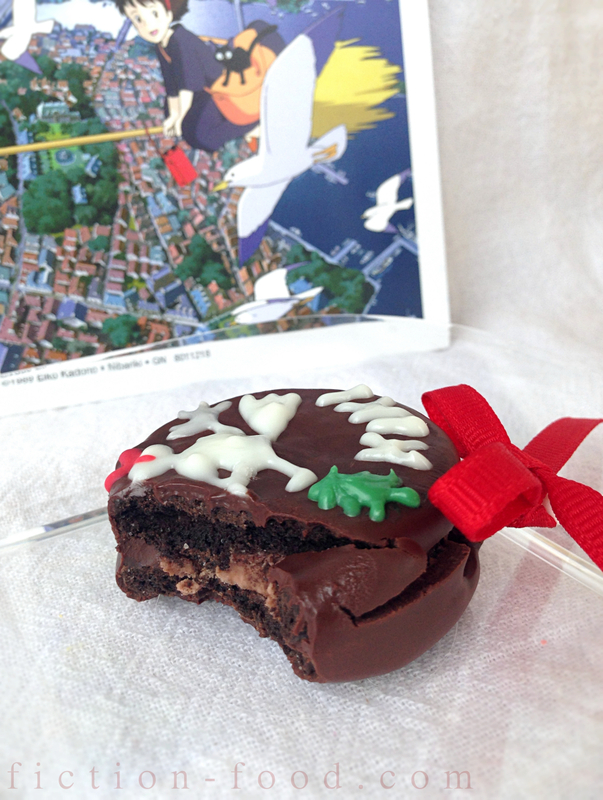 Place the cookie pops into the styrofoam block or pop holder. Give as gifts or invite your friends over for a "Kiki" viewing party! I've gotten skeptical about blogs that link to mine, as I'm sure you're familiar with, since most of them are spambots -- it was such a treat to go to your blog and see all the cool things you've made! Zelda pumpkin soup!! :D I've often been tempted to start a Zelda food blog but the Final Fantasy one is about all I can handle right now. Anyway, thanks for the link, I linked you back on mine with pleasure and look forward to digging into your archives! Awesome! I'm glad you came to visit! I'm always excited to find more sites in the fiction food community. Your site is incredibly well populated with recipes! So impressive! You should totally compile a cookbook.